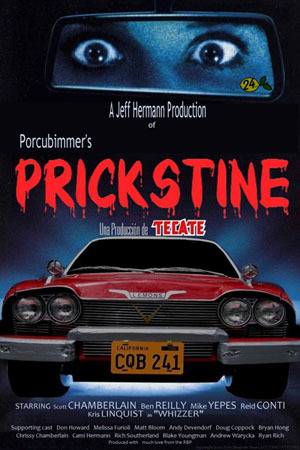 Team Prickstine | The Official Website of the 24 Hours of Lemons race team Prickstine! Welcome to the website for Prickstine, the 24 Hours of LeMons race team! Each LeMons race is for cars purchased, fixed up, and track-prepped for a total of 500 dollars or less. But before reaching the grid, you'll have to survive trials like the Personal-Injury-Lawyer Anti-Slalom, the Marxist-Valet Parking Challenge, and the Wide Open Throttle Rodthrowapalooza. Twelve hours into the race, the car voted People’s Choice is called in and awarded a cash prize; simultaneously, the car voted People’s Curse is called in and summarily destroyed. At the end of 24 hours, a gala awards ceremony plies the survivors with trophies, plaques, and four-figure purses in canvas bags full of nickels. What's not to like? Please visit one of the links to the left for more information!